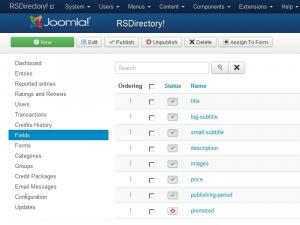 In the Fields tab you can define and manage fields that can be later added to any RSDirectory! form. Credits: Displays the number of credits that will be subtracted if the user fills in this field when adding a new entry. These fields will be automatically added to every form you create and cannot be deleted. However, aside from Title and Publishing Period, other core fields can be unpublished. Globally: this is done via this Fields tab and will unpublish the field for all forms. Per form: via Forms tab while configuring your form. Description: The entry's description. HTML code can be enabled or disabled for it. Also, starting with version 1.1.0, content plugins can be loaded for this area by setting Prepare content to Yes in the field's configuration. 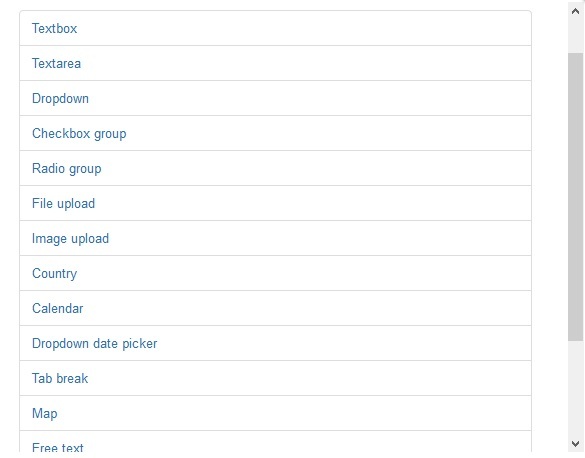 Images: A file upload field through which users can add an image gallery for their entries. 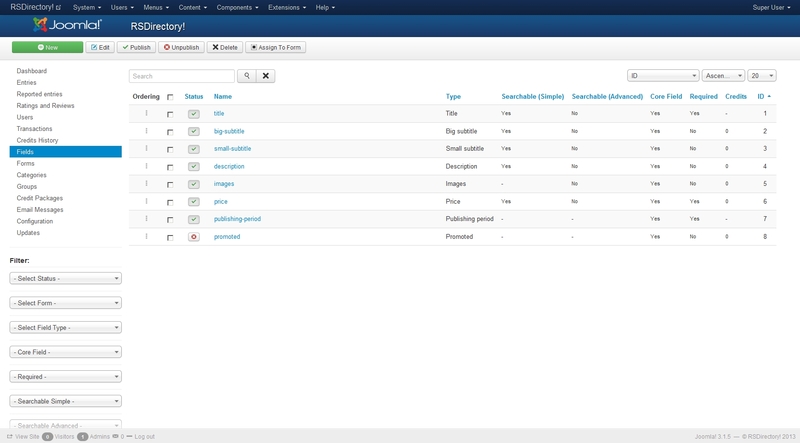 Aside from its default Credits property, you can also set up a Credits per image cost. The field can be configured to only allow a Maximum number of images and a Maximum file size in KB (kilobytes), as well as only certain image extensions. The Title, Big Subtitle, Small Subtitle and Description core fields can be customized, per form, through the use of placeholders. Any modifications made to these fields will only be reflected in the frontend after the titles have been regenerated. Please consult the Configuration article in our documentation, in the Regenerate titles area for more information on this topic. The most common HTML fields are available for usage, along with some custom ones. Each field type has it's own configuration options, click on the links listed below for detailed information on how to set them up.